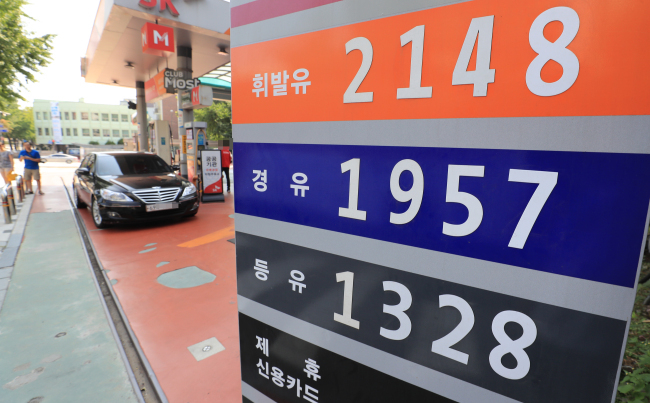 South Korea is expected to face growing inflationary pressure in the coming months due to rising oil prices, the fallout of a record heat wave and signals of public utility rate hikes, observers noted Tuesday. The key point at issue is whether inflation will rise as high as to near the 2 percent mark, in which case the central bank is likely to speed up its retrenchment timeline and possibly raise the policy rate within the year. The recent weather factors and the mounting signs of utility rate hikes have recently increased inflationary pressure, adding onto the climbing global oil prices, according to the Bank of Korea. Prices of the benchmark Dubai crude peaked at $74.4 per barrel in May from $60 earlier this year and are expected to remain above the $70 level per barrel for a while due to geopolitical risks in the Middle East, officials said. The oil price factor weighed down upon Asia’s fourth-largest economy, which is fully reliant on imports for its domestic oil demands. The price of liquefied natural gas soared 39 percent in May-July and has been forecast to go up another 3-4 percent in September. Adding up to the consumer burden, Seoul and other major city governments are set to increasing public transportation fares, as well as water and sewage rates. Of them, Daejeon is considering a bus fare hike of up to 20 percent as early as within the year. Up to the first half of this year, the government contained public rate hikes in consideration of the slow-growing economy-- a factor which, according to the BOK, had an effect of lowering the inflation rate for the second quarter by 0.2-0.3 percentage point. The current heat wave, the worst recorded since 1994, is another critical inflation variable. According to the Ministry of Agriculture, Food and Rural Affairs, prices of radish and cabbage -- benchmark vegetables here -- were 20-40 percent higher than in previous years as of mid-July. Earlier this month, the central bank froze the nation’s key interest rate at 1.5 percent for the eighth consecutive month. The inflation rate forecast for this year was also sustained at the previous 1.6 percent. Sustaining the wait-and-see stance, BOK Gov. Lee Ju-yeol has repeatedly noted that “further alleviation of monetary easing will take place according to the inflation rate,” suggesting that the rate might be hiked sooner if inflation increases. Some skeptics, however, pointed out that these price factors should not affect the monetary policymakers’ decision. “The latest inflation factors all come from the supply perspective,” said Kim Chun-goo, researcher at Hyundai Research Institute.